Mrs. Keller's Nine Patch is an interesting name for this quilt block because, depending on how you look at it -- (and your colour choices for fabric) -- it contains a nine patch block in the centre (although you will really have to search for it), or the construction (as I have shown you here) is to make this quilt block as an "uneven" nine patch block. 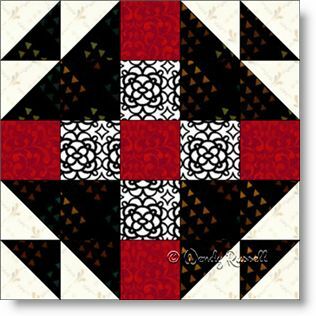 This quilt block could be considered as a five patch as well, because it is made on a 5 x 5 grid. All in all, this is an easy block to construct and you have great fun with your colour choices.